People are Funny, Rattlesnakes are not. I decided to start my training this week for The Next Big Thing with a hike up a familiar trail. I was around 5 years old when my intrepid Mother introduced me to Mount Baldy. I’ve hiked it countless times in the last 50 years, although I must admit it’s been about 15 years since the last one. I guilted my daughter into going with me. Guilted is not only a word in my family, it’s a way of life. Don’t feel sorry for her, I dish out only a fraction of the steady diet my Grandma and Mother fed me…and I gave THEM grandkids. From the garage I dug out an old faded purple fanny pack (circa 1992, which I still think is only 10 years ago) but pass on the hiking boots from about the same year. I make a couple of sandwiches, grab a couple of waters and off we go. I really don’t care about how that fanny pack must look, who will see us anyway? My first indication that things had drastically changed was when we pulled in the parking lot at the trailhead, it was early morning and already full with what seemed like a thousand cars. What the heck? Who blabbed about my mountain? We park about a mile away from the parking lot on the narrow mountain road and proceed to the trailhead where we merrily (I was merry anyway) began our hike. This trail gains 5,000 ft. in 5 miles. I didn’t really think about if I was ready for that at the time, just buoyed by the memory of how easy it was for me in the past. I will pay dearly for that later (as it turns out, hip bursitis is the gift that keeps on giving). I begin to notice all of the fancy shmancy equipment everyone is carrying. They all have a tethered hiking pole in each hand (I later ascertain are called trekking poles), pretty cute hiking boots (unlike the sneakers I had on), and day packs (my daughter informs me they are hydration packs) on their backs. And I with my yoga capris and fanny pack complete with a water bottle tucked in either side of the waistband. Just call me old school. I don’t take selfies, so here is the same outfit earlier in the year sans fanny pack and waistline stowed water bottles. You’re going to have to visualize that hot mess. Terribly clever of her to troubleshoot for us like that. We were only about 10 ft away from her at the time, so we stopped and slowly crept up to within 5 ft. to where she was pointing. This guy was huge, and black (I’d never heard of a black rattlesnake before) which made it perfectly camouflaged in the shade of this bush, and mad about being stepped on. Her chivalrous husband was worried about all of us having to pass a mad snake on this narrow trail (this part of the mountainside is steep shale, no way to go around it), so he picked up a large rock and threw it at the rattlesnake, presumably to scare it away. I don’t know about rattlesnakes in general, but this one was not intimidated by being under attack. The rock just served to make it a higher level of furious. I had no idea a rattle could be shook that fast. He had been coiled before, but now he meant business. He head was low in the coil (right next to the rattle in the photo above) and was ready to strike at anything that moved. I picked up a pine bough that didn’t seem long enough but would have to do, and distracted him with it while each of us took turns passing by. He rattled and darted his forked tongue in and out with mad skills all the while. Us two sets of humans parted ways but agreed to spread the word to unsuspecting hikers. Since we were ascending and they were descending, we could be sure to saturate the hiker population on the trail that day. My daughter put a colorful flyer she had been handed (ironically about Jesus Saving) in the middle of the trail, under a rock about four feet away from where our very angry reptile friend lay. She’s kinda brilliant that way. Our hike was now value added for sure. I warned everyone descending as we ascended about the rattler. I do now. I googled it when I got home. It was an Arizona Black Rattlesnake. Doesn’t California have enough rattlers of its own? I’m not mad about it though. Reptiles probably don’t honor state lines like they should. I assume a few other folks could read my lips since they never took their earbuds out or even slowed down to hear what I was trying to tell them. I suspected that my bag-lady hiker ensemble probably lent credibility to me appearing as though I’m talking to myself in their case. If any of the earbud peeps got bit I would have to say that’s a strong argument for unplugging while out in the wilderness, but in reality there is probably no saving them from themselves. Well alright Wyatt Earp. It’s the snake’s lucky day you’re pressed for time, otherwise you’d wrangle it would ya? Would you take off your fancy equipment first if you had more time? 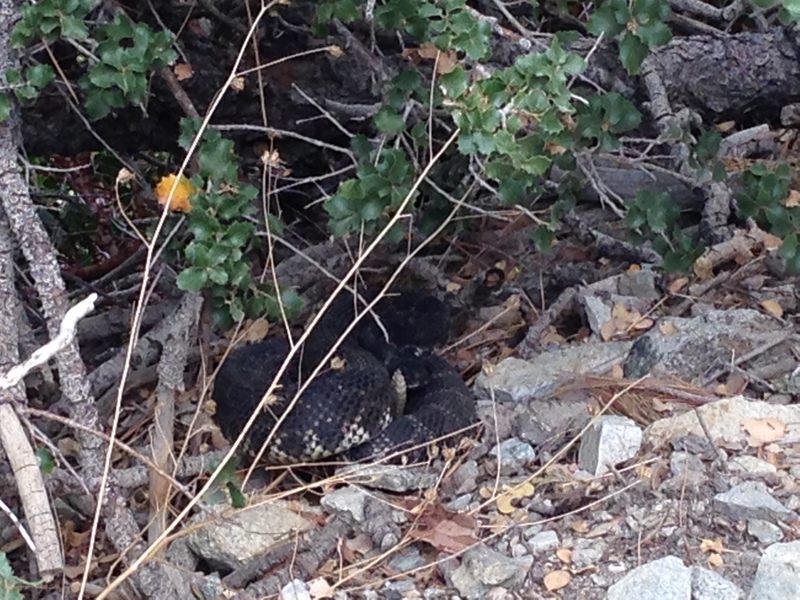 This entry was posted in Backyard Adventures, Bucket List and tagged Arizona Black Rattlesnake, Backyard Adventures, Black Rattlesnake, Bucket List, Bucket List Adventures, Bucket List Training, Bucket List Value Added, California Rattlesnakes, Hiking Mt. Baldy, Hiking Southern California, Mt. Baldy, Rattlesnake by ckdenson. Bookmark the permalink.